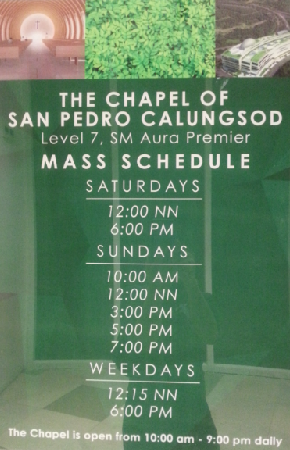 SM Aura Mass schedule is as follows: Saturdays - 12NN & 6pm, Sundays - 10AM, 12NN, 3PM, 5PM & 7PM, Weekdays - 12:15NN & 6PM. 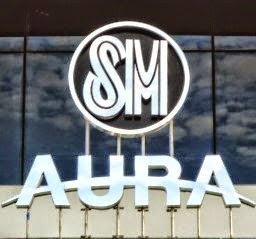 SM Aura Premier is located opposite the large parking area of Market Market in 26th St, Bonifacio Global City (BGC). Market Market is on the north of 26th St while SM Aura is on the south. See map below this post. Bonifacio Civic Center is the 34-storey building attached to SM Aura. The nearest Bus Stop if you're going to SM Aura from EDSA-Ayala via BGC Bus is the BGC Bus Market Market Terminal. It is located adjacent to Market Market bldg. After getting off the bus, walk away from Market Market bldg toward the large parking area. The mall across 26th St, the road next to parking area, is SM Aura Premier. Head to pedestrian lane to cross 26th St.
BGC Bus is the convenient means of transportation to SM Aura from MRT-3 Ayala Station. You can get to SM Aura from as far as Santolan Pasig or Monumento Caloocan by two train rides and a BGC Bus, i.e., LRT-1 plus MRT-3 plus BGC Bus or LRT-2 plus MRT-3 plus BGC Bus. Just get off the train at MRT-3 Ayala Station, ride a BGC Bus "East Route", and alight at Market Market Bus Station. For more details on how to ride a BGC Bus from MRT Ayala Station, read this separate guide: Commute Guide To Buildings & Attractions Inside BGC From MRT Ayala Station. You can go directly to SM Aura from these locations: Antipolo, Ayala, Crossing, FTI, Guadalupe, Pasig, Pateros, Rosario, SM Bicutan, SM Marikina, SM Masinag, SM Megamall, SM Moa, Taguig Bicutan and Taguig Tipas. The reason for this is because UV Express Terminal in SM Aura aka SM City Taguig is located at the basement parking few meters from mall entrance. Unlike BGC Bus Terminal, riding a UV Express is more convenient in the sense that you don't need to walk far from the terminal. So, if you preferred this mode of transportation, head to the respective terminals of UV Express in your area, e.g., SM Megamall Terminal - back of Bldg B and SM MOA - North or South Terminal. There's also a jeepney terminal from EDSA-Ayala. The jeepney terminal is located at the back of Shell Gasoline Station. The difference between riding a jeepney and riding a BGC Bus is that the jeepney goes directly to Market Market. So, it's faster compare to a BGC Bus which passes through various streets to drop off and pick up passengers on its designated Bus Stops. In going to SM Aura, ask the driver as to where you can alight nearer to the mall. Take a jeepney with "Guadalupe Gate 3 Ft Bonifacio" signs on both sides of its body and "Market Market Gate 3" or "SM Aura" signboard on its front. The loading terminal is located along Burgos St between Jollibee and McDonald's. Burgos St is perpendicular to EDSA and both McDonald's and Jollibee are located at the opposite corners of EDSA and Burgos St. From MRT Guadalupe Station, it's best to enter the connected mall, use the escalators and head toward Burgos exit. Ask driver to drop you off at SM Aura or unloading area nearest to SM Aura. Ride a jeepney bound for "Guadalupe Tulay" and with "Ilalim" secondary sign. Get off the jeep at Guadalupe Commercial Center, the mall connected to MRT Guadalupe Station. Go to loading terminal of jeepneys that ply "Guadlupe Gate 3 Ft Bonifacio" route. Follow direction given above (From Guadalupe). Go to the big building of Gate 3 Plaza mall where a Jeepney Terminal is located in its front along Lawton Ave. This is also good if you're coming from any point of Chino Roces aka Pasong Tamo Ext from EDSA to Lawton Ave, just ride a jeepney with "Gate 3" sign on its front. Ride the same jeepney from Guadalupe, this time with "Guadalupe Market Market" or "SM Aura" signboard on its front. The jeepney also has marking on its sides that read "Guadalupe Fort Bonifacio Gate 3. Ask driver to drop you off at SM Aura. Just ride a jeepney with "Guadalupe Tulay Ilalim" sign and follow direction given in "From Pedro Gil Taft" mentioned above. Ride any bus with secondary sign that reads "Ayala Ibabaw" and alight at unloading zone near MRT Ayala Station. Go to the terminal of jeepneys bound for Market Market or the BGC Bus. Alight at Market Market and use the pedestrian lane to get to SM Aura Premier. If your location is not listed here and you want me to guide you in commuting to SM Aura Premier, just use the comment form below. At this point, I need to say goodbye for now. Happy shopping! Please share this guide to help others in going to SM Aura Premier. Thanks! 'Pinch-out' the map to zoom in so that icons get separated and give clearer guide. Tap each icon to read details. @ kazusa-minase. Yes, there is. Just alight at EDSA/Magallanes Station. Ride a bus or a MRT train to Ayala, then take the BGC bus. how to go to sm aura coming from sm city masinag? @ irish garcia. Hello po. I have stipulated po in this article that you can get directly to SM Aura from SM Masinag by only one ride via UV Express. Please go to UV Express Terminal at SM Masinag and ride one of their coasters bound for SM Aura. You will be dropped off right at the basement parking of SM Aura just meters away from mall entrance. @ irish garcia. You are welcome. By the way, re shuttle, if you're referring to BGC Bus, they are operational even on weekends. If you had read an article telling otherwise, please share with us. So that I can verify. Thank you as well. hw cn we get to SM aura if we r frm FTI ? @ iya voreshka. You can take either a jeepney that goes directly to Market Market or a bus bound for north of Metro Manila (e.g. Monumento, Fairview, etc). If you prefer bus, alight at Ayala then take the BGC Shuttle, follow direction I have mentioned above. Also, please read paragraph under subtitle "By Public Bus" to get complete details. How can I get there from SM North Edsa? @ Ann Malaine. Take bus with "Ayala Ibabaw" sign or MRT. Aligt at ayala and ride BGC bus East Route. Alight at Market Market ang cross the road to get to SM Aura. 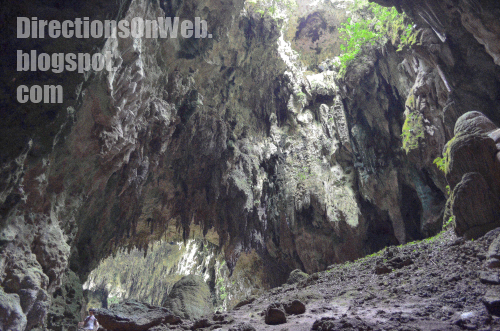 is there a way to get there thru lrt or mrt station? @ owen. Yes, it is clearly written on the post. Please read the full article, thanks. how about if im coming from taft avenue station? @ Rui Labrague. Take a MRT train, alight at Ayala Station and take BGC bus or jeepney to SM Aura. @ Akiles Reyes. In going back to Alabang, go to open parking in front of Fiesta Market. The corner of parking area near to Gerry's Grill is where bus bound for Alabang parks. @ Yosha Trapal. There are lots of options. If you want fast, here is one. Take a jeepney to Quiapo. Walk to LRT Carriedo Station and take a train bound for Bacaran, get off at EDSA Station. Use the footbridge to MRT Station. Take another train bound for North and alight at Ayala Station. From Ayala Station, either take a BGC Bus or a jeepney bound for Market Market/SM Aura. Details are written in the post. Hi do you know what time the sm marikina Uv terminal opens? Thansk! @ Hannah Mangibin. Sorry po, we don't have info on that. You may wish to inquire at SM Marikina Information Counter. @ Mich Fabunan. You are welcome po. is it possible to ride FTI buses on the way to sm aura if you came from edsa shaw? @ Protacio Kinalampagan. Yes, just make sure that there's a secondary sign that reads "Ayala Ibabaw." how to get there if im from festival alabang? @ straubrey kelamansi. Ride a bus with "Ayala Ibabaw" secondary sign, alight at MRT Ayala, walk to jeepney terminal at the back of Shell or the BGC Bus Terminal there. Ride a jeepney bound for Market Market or BGC bus with "East Route" sign. How about going back? from SM Aura to Las Piñas City? Please reply since I'm not familiar around that place.. what's the fastest way to get home without riding MRT. @ Ambrozia Macabre. You can take the bus direct to Alabang from Market Market. Just go to the large parking area and head to the corner near Gerry's and wait for the bus. You can also check first if there are UV Express route bound for Alabang or Las Pinas at their terminal in SM Aura. @ krishna luna. Take a bus to Alabang. Then bus with "Ayala Ibabaw" sign. Next, alight at Ayala, walk to the back of Shell Gas Station at the corner of EDSA and McKinley. Follow the direction mentioned in the article under Jeepney. Or you can ride a BGC "East Route" bus, alight at Market Market which is just opposite SM Aura. For details, please go to Commute Guide to BGC from MRT. @ applegreen. Bus to South West Integrated Terminal. City bus with "Ayala Ibabaw" sign. Alight at MRT Ayala. Follow direction given at the article. Same route in going back to Dasmarinas. Return the way you got to SM Aura. From sm aura, how to go to cubao? Are there fx terminals? @ Seraphim Phoenix Sy. Kindly check FXs there if they serve Cubao bound shoppers. If not, take BGC Shuttle to Ayala and ride MRT to Cubao. coming from sm aura to sm masinag? @ John Michael Fernandez. You can try UV Express. @ jengpretty. There are buses and jeepneys from Taytay that serve passengers going to EDSA. Take one of them. Once in EDSA, take another bus that I have mentioned in the post and follow the direction I have given. You can also take MRT if your first ride is jeepney with terminal near MRT Shaw. hi.if i came from sucat highway,ano po ung sasakyan n dadaan papuntang sm aura?.. not familiar po kc sakin ung way papunta dun eh..thank you. i will wait for the reply. i mean is there a one ride only like from sucat highway to sm aura?? @ Angielyn Reyes. Take a bus with "Ayala Ibabaw" sign at the bus stop in Sucat/SLEX. Alight at Ayala and follow direction given in the article. @ Christine Flores. In going to SM Aura from Tayuman, take LRT train to EDSA, transfer to MRT train to Ayala, then take the BGC Shuttle East Route to SM Aura. what about from gilpuyat lrt1 station pasay? how can i go to sm aura? @ Allan Asuncion. In going to SM Aura from LRT Gil Puyat Station, take a bus with "Ayala" secondary sign and alight at unloading area in Rustan or Glorietta. Walk along Ayala towards EDSA, cross EDSA and take the BGC shuttle East Route to SM Aura. How to get there if I am at STI Academic Center Ortigas-Cainta. Thanks for the reply! How can i get to sm aura from resorts world manila with jeepney? @ Chona Valmonte. Bus or jeep to EDSA-Ortigas. Ride bus in southbound EDSA with "Ayala Ibabaw" secondary sign. Alight at Ayala Ave. Cross EDSA, go to the BGC bus terminal and follow direction given in the article. @ Zet Mayuga. You have to cross Andrews Ave and take a "Nichols Ikot" jeepney. Alight at its terminal in Lawton Bridge. Walk and cross SLEX via Lawton Bridge. Walk along Lawton Ave until you get to the terminal of "Gate 3 Guadalupe" jeepneys. Ride the jeepney being loaded with passengers. The jeepney destinations here are Market Market and SM Aura. And there are also jeepneys with "SM Aura" signs on them. Do the UV expresses from Megamall and MOA go directly to SM Aura? How much is the transportation cost? @ Gretl Roquim. I need to check on that to give you accurate answer, will let you know. @ ervinjake03. Yes, it is written in the post - under "From Lawton Ave-SLEX-PNR Nichols. @ Restie Pagulayan. Provincial bus to EDSA/Kamuning Terminal, alight at EDSA/Ayala (MRT-3 Ayala Station), then, BGC bus to SM Aura. Read the article for details. Sir Paano nman po kung manggagaling ka ng Cavite from Coastal mall..
@ Ermell Pangilinan. Sorry for late reply. To all who need assistance, it would be better if you add Lag alag to your circle as he gets to read your questions immediately and can reply asap. From Cavite, bus to Southwest Integrated Terminal, then, take a city bus bound for Cubao or Monumento or Novaliches, alight at Ayala, then follow direction given in this article. how do i get there from paranaque? @ Fay marisse ramos. Follow route from Baclaran. How do I get there from Gateway, Cubao? How can I get there after riding an Ayala UV express from Ortigas Extension. Hi! How do I get from Sampaloc to SM Aura? I badly need to know ASAP since I’m meaning to watch a concert in SM Aura on the 26th. I’m from Ilocos so I’ll take a bus to Sampaloc. I don’t have any idea on how to get from Sampaloc to SM Aura, then back to Sampaloc again after the concert (cos it’s where the bus terminal going back to Ilocos is located in) =( Hoping for your reply! It would really help me A LOT. Thank you so much!! Sorry if I posted it twice. But thanks in advance really! @ Laborem Joey Bobiles. You didn't specify the exact location you will be originating in Sampaloc so I will assume it's in Espana. Take a jeepney with Baclaran-Cubao route which bears sign "Pasay Taft Baclaran" on its front. Alight at EDSA, take a MRT train and alight at Ayala Station. Walk to terminal of jeepneys headed to Market Market or you can ride the BGC Bus "East Route" and follow directions given. In getting back to Sampaloc, ride a jeepney or BGC bus headed back to EDSA-Ayala. Just take the opposite direction, i.e., MRT to Taft, "Espana Cubao" marked jeepney. Hope this directions help you. Hi! Thank you! You've been really helpful. @ Christian Gorospe, Havoc Complexity, Andy Abuel. Jeepney to Tiendesitas + bus to Ayala. Gateway = bus to Ayala. From UV Express Terminal, cross EDSA. @ Laborem Joey Bobiles. You're welcome. You can also take LRT-1 to EDSA for fast commute. Just get off the jeepney from Espana at UN Ave Station. hi there! how do i get to sm aura from partas cubao terminal (it's in 816 Aurora Boulevard corner P. Bernardo St., Cubao 1109 Quezon City, Quezon City) and also if i'm from partas pasay tramo terminal (in Aurora Blvd Barangay 149, Pasay City). i'm trying to find the easiest way to sm aura kasi. thanks again! you're super! @ Laborem Joey Bobiles. From Cubao Terminal, EDSA is walking distance. But it's far for you, there's a lot of jeepney. Take one of them and alight at EDSA. Option 1 is to take a bus with "Ayala Ibabaw" sign and alight at Ayala. Option 2 is take the MRT to Ayala Station. Once there, go to The Fort Bus Terminal or jeepney bound for Market Market/SM Aura. From Aurora Blvd in Pasay, you can take trike or pedicab to EDSA and then ride a bus with "Ayala Ibabaw" sign or MRT to Ayala Station, then follow direction given to SM Aura. How to go there from sm bicutan? I know there are uv express rides from sm aura to sm bicutan but I don't know how to go if I will come from sm bicutan. @ Shona Peñafiel. Cross SLEX, take bus with "Ayala Ibabaw" sign, get off at Ayala, follow given direction above. Hi, May UV Express po ba sa ATC to SM Aura? @ Aira May Sarte. Aalamin ko po ang ibig sabihin nyan, marami kc kahulugan yan e.
@ Aira May Sarte. Eesked ko pa po ang ocular ko jan.
@ Aira May Sarte. Wala po anoman, mabuti din po at alam nyo ang pagsakay ng bus. @ Aira May Sarte. Pkibasa po disclaimer ko under Legal. Hi! Paano po mag commute from SM Aura/Market2x going to Las Pinas particularly to Casimiro? @ Katrina Sanchez. Pde kyo dumerecho muna Alabang. Meron po bus sa parking ng MarketMarket near Fiesta Market. From Alabang, sakay npo ng bus o jeepney to Las Pinas. Jeepney to Guadalupe, bus to Shaw Blvd, jeepney to pasig, alight at RMC. Hello po. I wanna ask how to get to SM Aura from Philcoa, or either kahit galing SM Marikina. I'm from Montalban po kase. Pero, kahit sa may Philcoa or SM Marikina nalang po kame sasakay. My friends and I were planning to go there because of NBA Cafe MNL. But, we don't know how to go there kapag magco-commute. Hoping for your reply because it would help us a lot! Thank you! How to get to SM Aura from Philcoa? Take bus with Ayala Ibabaw sign, get off at Ayala MRT, cross EDSA via MRT, follow direction written in the article. In EDSA take 'Fairview' bus, get off at V Luna. walk or take jeepney to V Luna Hospital. Pano po papuntang sm aura pag galing ng quiapo? Jeepney to Pedro Gil then follow given direction. Once in EDSA, follow direction given in the last part of this article. Driver will be the right person to ask for this information, thanks. Hi there.. how do I get to SM Aura from baclaran? Direction from Baclaran is written in the article. Yung sm marikina to sm aura n uv express katipunan avenue ba ang way? Thanks for asking, I will check it out. Pano po kpg galing sm lipa btngas. Pno po punta d2 sm aura. Get off at Ayala, follow given direction, thanks. I need to be sure on that, thanks. I'll let you know once I got the update, thanks. how to go in Sm aura form SM north edsa using MRT? and what is the station of MRT? thanks. Pls reply po asap need po tlaga now. I am so sorry but I needed to say this: If you have read the article there's no way you would miss the information you needed. Please read our Disclaimer under Legal. 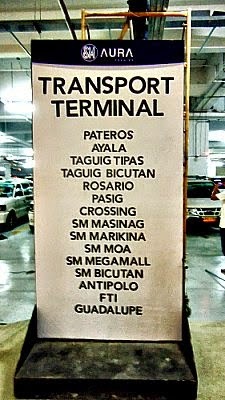 You must take any public transport to Edsa then follow direction given in this post. Kindly coordinate that with their disparcher. Thanks. hi im from cainta junction how to get to sm aura or market market? or even in bgc? thanks i need this for my application. Kindly check first UV Express there. If none take a jeepney or bus to EDSA then follow directions given. Bus or MRT to Mckinley-Edsa. BGC bus or jeepney to SM AURA. Read the whole article, please. Provincial Bus to EDSA, take MRT or city bus to Ayala and follow my given direction. Thanks for this informative directions!